The proceeds from IEC’s annual charity clay shoot have been presented to the Midlands Air Ambulance and a video with highlights from the day is now available to watch on our new IEC Solutions YouTube channel. 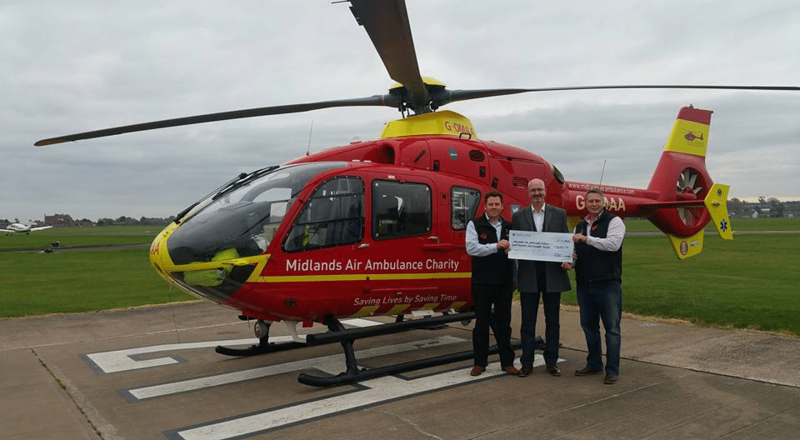 This year’s charity shoot raised £1,500 and IEC’s Managing Director Keith Wilson and Sam Kenworthy, Softlay sales manager and organiser of the shoot, were invited to the Midlands Air Ambulance charity headquarters to present the cheque. Midlands Air Ambulance is the charity responsible for serving the communities of six Midlands counties. Each air ambulance mission costs £2,500 and more than £7 million is needed each year to keep its three air ambulances operational, which is donated entirely by the public and local businesses. A video which captures the highlights from the fifth annual shoot, which this year took place at IEC’s brand new poultry site is also available to watch on YouTube. The video not only captures footage of the 150 plus guests who attended, it also shows more of the innovative new poultry site which comprises four broiler sheds, each with the capacity to house 58,000 birds.